Certain business and work-related expenses, such as the costs of laundering clothes, may qualify for a tax deduction. Tax deductions reduce your overall liability, which can reduce the amount of taxes you owe to the federal government. Keep accurate and thorough records of all of your eligible expenses so that you can determine if you are eligible to take the deduction and calculate what your total deduction will be. Review Internal Revenue Service regulations regarding deducting business or non-reimbursed employee expenses to determine if your laundry costs are eligible for deduction. Information regarding non-reimbursed employee expenses can be found in IRS Publication 529 and information regarding business expenses can be found in IRS Publication 535. Ensure that your closing expenses are necessary and appropriate. Expenses for clothing that can be used for other purposes besides your business or work-related activities may not be deductible. Calculate your annual total expenses for business or work-related laundry costs. These are expenses that are only used for business or work-related laundry costs, and not expenses for personal clothing items. If you own a business as a sole proprietor, enter your home laundry business expenses on a Form Schedule C, under Part 2 Expenses. All of your business expenses will be deducted from your gross business income to determine your overall net profit or loss from your business. Can I Still Get a Tax Write-Off if I've Been Reimbursed for Business Expenses? Enter the profit or loss from the Schedule C to the appropriate tax form. According to the IRS, if you have a profit or loss, enter the amount on line 12 of Form 1040 or line 13 of the 1040NR form. Complete the remainder of your tax forms, following the instructions and guidelines provided by the IRS. If you have job expenses as an employee, look at your adjusted gross income, or AGI, on line 38 of Form 1040 or line 37 of Form 1040NR. Multiply the AGI by 2%. The portion of your non-reimbursed employee expenses that is deductible is only that portion that exceeds 2% of your adjusted gross income. For example, if your AGI is $50,000, your total laundry and other non-reimbursed business expenses would need to exceed $1,000 to be deductible. Enter your eligible deductions on Form Schedule A-Itemized Deductions, under the Job Expenses and Certain Miscellaneous Deductions section. Calculate all of your deductions and enter it on Line 29 of Form Schedule A. Enter this amount on Line 40 of Form 1040. If you do not itemize deductions, you would not be able to claim any work-related laundry expenses. The IRS provides taxpayers with two types of deductions, the standard deduction or itemized deductions. 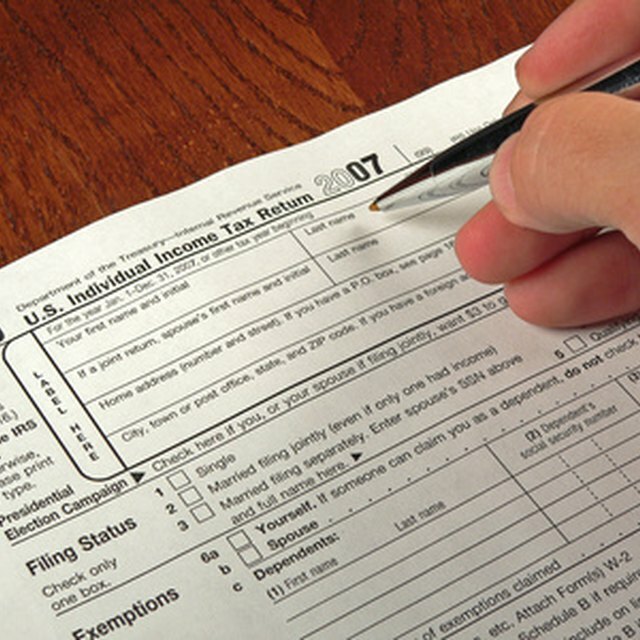 In 2010, the standard deduction was $5,700 for a single taxpayer. Therefore, a single taxpayer's total of eligible deductions must exceed $5,700 to derive a financial benefit from itemizing deductions. You may want to consider purchasing separate cleaning supplies that would only be used when laundering your work clothes.